Stealing hotel towels has been a recurring joke in sitcoms and standup comedy routines for decades. But in real life, towel theft is no laughing matter. In a Hotels.com survey of 8,600 travelers, 1 in 3 people admitted to stealing “souvenirs” from hotels and resorts, and not surprisingly, towels were the number one item stolen by Americans. Hotels and resorts have taken different steps to address chronic towel theft. Some hire employees to manually sign out towels to guests, while others put up warning signs about fees charged for stolen towels. Despite these measures, enormous quantities of towels continue to vanish, and the painful price tag for replacement towels is often viewed as the unavoidable cost of doing business. Marc Adcox, Assistant General Manager at the Island Vista Resort in Myrtle Beach, faced similar problems. 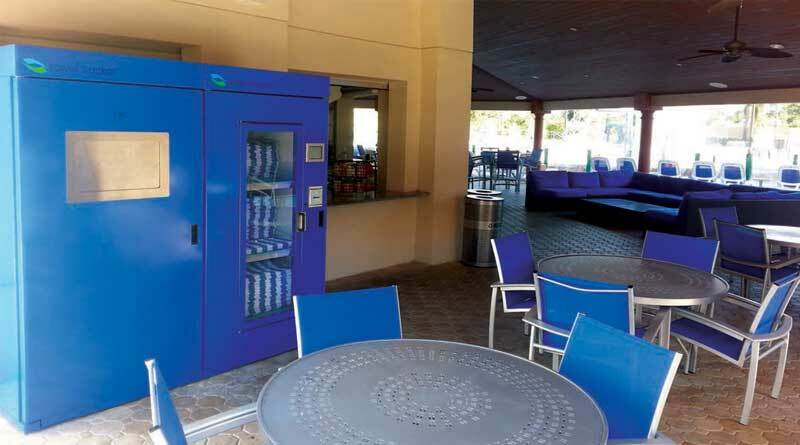 He stated, “We gave guests a pool towel card, but it was not really trackable and we experienced substantial towel losses.” While searching for a solution to this problem, Adcox received a brochure about a high tech towel management system called Towel Tracker. Towel Tracker (www.toweltracker.com) is comprised of two vending machine-sized cabinets, one for clean and one for dirty towels. Resort guests swipe their room cards through a reader on the clean towel cabinet, then open the cabinet door and take the towels they need. Each towel has a washable RFID chip imbedded in it, and when the cabinet door closes, the cabinet scans the remaining towels and can tell exactly which ones were taken. The towels are then assigned to the guests’ account—just like borrowing books from the library. When guests put used towels into the return cabinet, the RFID tags are scanned again, and the towels are removed from their accounts.